"Abraham's Curse: The roots of violence in Judaism, Christianity and Islam," by Bruce Chilton. Bruce Chilton discusses the story in Genesis 22 that describes Abraham's intent to commit a ritual execution/sacrifice of his son. He shows how some extreme radical fundamentalist groups within modern-day Judaism, Christianity, and Islam have interpreted this passage as a justification for their violence and martyrdom. "And they came to the place which God had told him of; and Abraham built an altar there, and laid the wood in order, and bound Isaac his son, and laid him on the altar upon the wood. And Abraham stretched forth his hand, and took the knife to slay his son." "In this thought-provoking study, Bard College professor Chilton (Rabbi Jesus) asks how the Abrahamic faiths have understood Genesis 22, the story of the binding of Isaac. All three religions include a strand of interpretation that reads the binding of Isaac as valorizing the sacrifice of human life. Some rabbinic texts, for example, suggest that Abraham did in fact nick Isaac's neck, shedding the boy's blood, and that Isaac offers a model for the necessary readiness for martyrdom. Christianity has seen Isaac as prefiguring Jesus' crucifixion, and Christians, too, find in both these sacrificial stories an approval of martyrdom. In Islam, Chilton finds a range of interpretations, some of which gradually make Ibrahim more and more aggressive, to the point that Allah could only prevent the slaughter... by miraculous means. These interpretations appear to underwrite violence, but Chilton also finds within Jewish, Christian and Islamic sacred texts a corrective: a clear insistence that God does not want human beings to sacrifice ourselves or our children. Today's violent fundamentalists, Chilton claims, overlook those correctives and take their cues from readings of Genesis 22 that seem to favor human sacrifice. Chilton produces yet another creative and very relevant historical account." Title: "Abraham's Curse: The roots of violence in Judaism, Christianity and Islam." Rating by one Amazon customer: 5 out of 5 stars. "The Fundamentalist Mind: How polarized thinking imperils us all" by Stephen Larsen. "The events of 9/11 and the ensuing conflicts in the Middle East have demonstrated how fundamentalist thinking, by all involved, can cause suffering on a global scale. In this careful study, Stephen Larsen examines the psychological roots of fundamentalism. Fundamentalist thinking occurs, says Larsen, when people read metaphors literally and being certain becomes more important than anything else. Larsen explains how our brains can be hardwired to believe this way. Any one of us can fall prey to inflexible, black-or-white thinking. Larsen provides a guide on how to recognize fundamentalist thinking in ourselves and in others so that we can curb negative tendencies and create a more compassionate and peaceful world, one person at a time." "We are all fundamentalists whether we acknowledge it or not. We were born into a world of myth and metaphor and have come to internalize the stories we were told as children as the literal interpretations of much greater and deeply symbolic lessons. When we fall into such patterns, according to author and psychotherapist Stephen Larsen, we lose all flexibility and freedom of thought. We become split by dualistic thinking©bad versus good; black versus white©and are weighted down by definitive, concretistic principles and behaviors that alienate us from one another. Dr. Larsen explains that we can avoid such pitfalls by identifying our 'inner fundamentalist' and becoming more open-minded individuals." "In Fundamentalist Mind, Dr. Larsen follows suit with famed 20th century mythologist Joseph Campbell, citing both the creative potential and destructive power of myth. We can use myths as metaphors to guide us in our everyday lives. However, when we perceive myth as literal truth we cross a dangerous threshold. We see a severe example of this transgression with the religious extremists who feel justified in committing acts of violence in the name of God. By differentiating between reality and myth and continuing to question rigid thought patterns, Dr. Larsen says we encourage our own psycho-spiritual growth." David Lindorff, author, Pauli & Jung: The Meeting of Two Great Minds: "Stephen Larsen has, in great width, approached fundamentalist thinking at its roots. This is an inspired work. Anyone who reads this book will benefit from this wealth of knowledge." Edward Tick, PhD., author, War and the Soul and The Practice of Dream Healing "Stephen Larsen has previously opened new doorways for exploring and healing the inner world through shamanism, archetypal studies and neurofeedback. Now, in his exciting and important new work The Fundamentalist Mind, Dr. Larsen combines his expertise with history, politics and religion to grapple with crises threatening our very survival." Neil Douglas-Klotz, author, The Sufi Book of Life, co-author, The Tent of Abraham: "Stephen Larsen's The Fundamentalist Mind stimulates us to look deeper into the spiritual and psychological wellsprings of fundamentalism, whether religious or secular, in all its forms. The journey on which he takes us is not merely political or sociological, but one that leads to roots of each of our most cherished beliefs. This is a must-read for understanding our own role in the headlines of fear we face each day." Stephen Larsen, PhD., received his Bachelor©s and Master©s from Columbia University and his doctorate from The Union Graduate School. He is Professor Emeritus of Psychology at SUNY Ulster. He has trained with Jungian Analyst Dr. Edward Whitmont and Dr. Stanislav Grof, as well as the famed mythologist Joseph Campbell in understanding the dimensions of myth and symbol. Title: "The Fundamentalist Mind: How polarized thinking imperils us all"
Rating by Amazon customers: 4 out of 5 stars. "How Jesus became Christian: St. Paul, the Early Church and the Jesus Cover-up" by Barrie Wilson. The Christ Movement (the Pauline Christians who followed a religious about Jesus created by Paul). So begins Barrie Wilson in How Jesus Became Christian where Wilson confronts one of the simplest questions of religious history and yet one that anyone rarely thinks about: How did a young, well-respected rabbi become the head of a cult that bears his name, espouses a philosophy that he wouldn't wholly understand and possesses a clear streak of anti-Semitism that has sparked hatred against the generations of Jews who followed him? Colorfully recreating the Hellenistic world into which Jesus was born ©©©©©©©©©©© a theologically cacophonous world filled with a panoply of Greek philosophies, oriental religions such as Mithraism and the Egyptian cults of Isis and Osiris -- Wilson brings the answer to life by looking at the rivalry between the "Jesus movement" led by James, informed by the teachings of Matthew and adhering to Torah worship, and the "Christ movement," headed by Paul which shunned Torah. Wilson suggests that Paul's movement was not rooted in the teachings and sayings of the historical Jesus, a man Paul actually never met, but solely in Paul's mystical vision of Christ,. Wilson©s persuasively then goes on to show how Paul established the new religion through anti-Semitic propaganda which ultimately crushed the Jesus Movement. Sure to be controversial, this is an exciting, well-written popular religious history that cuts to the heart of the differences between Christianity and Judaism. How Jesus Became Christian looks at how one of the world's great religions prospered and grew at the cost of another and focuses on one of the fundamental questions that goes to the heart of way millions worship daily: Who was Jesus Christ --a Jew or a Christian? Barrie Wilson is Professor of Humanities & Religious Studies at York University in Toronto, Canada. A specialist in early Christian origins, this is his first book intended for a general audience. Building on contemporary critical scholarship, it addresses some of the major puzzles he has identified in teaching biblical studies over a twenty-year period. An award-winning educator, his previous academic books focused on textual interpretation. Title: "How Jesus Became Christian"
"unChristian, What a New Generation Really Thinks about Christianity... and Why It Matters"
This book discusses a survey of Americans aged 16 to 29. The results point to major future shifts in Christian beliefs and practices. Review and/or order this book safely at 32% off the list price from the Amazon.com online book store. Starred Review from Publishers Weekly for 2007-OCT: Kinnaman, president of the Barna Institute, was inspired to write this book when Lyons (of the Fermi Project) commissioned him to do extensive research on what young Americans think about Christianity. Lyons had a gut-level sense that something was desperately wrong, and three years of research paints exactly that picture. Mosaics and Busters (the generations that include late teens to early 30-somethings) believe Christians are judgmental, antihomosexual, hypocritical, too political and sheltered. Rather than simply try to do a PR face-lift, Kinnaman looks at ways in which churches' activities actually may have been unchristian and encourages a return to a more biblical Christianity, a faith that not only focuses on holiness but also loves, accepts and works to understand the world around it. ... This is a wonderful, thoughtful book that conveys difficult truths in a spirit of humility. Every Christian should read this, and it will likely influence churches for years to come. William Dahl, of ThePorpoiseDivingLife.com and an Amazon.com customer: "Humility. It's a powerful thing. 'Unchristian - What a New Generation Really Thinks About Christianity' by David Kinnaman and Gabe Lyons is a literary seismic event that will rearrange the face of faith. Buy this book. Read it on your knees. Stay knelt until you are able to rise surrendered to what you thought you knew about being a Christian. One of my Top 10 for 2007." Daniel B. Clendenin of JourneyWithJesus.net and an Amazon customer: "A new book called unChristian (2007) by David Kinnaman of the Barna Group presents objective research that supports Borg's subjective anecdote. Kinnaman's three-year study documents how an overwhelming percentage of sixteen to twenty-nine year olds view Christians with hostility, resentment and disdain." "These broadly and deeply negative views of Christians aren't just superficial stereotypes with no basis in reality, says Kinnaman. Nor are the critics people who've had no contact with churches or Christians. It would be a tragic mistake, he argues, for believers to protest that outsider outrage at Christians is a misperception. Rather, it's based upon their real experiences with today's Christians. In addition to their statistical research, the book includes anecdotes from people who were interviewed, follow-on comments at the end of each chapter by some 30 Christian leaders, and reflections about why we've come to such a place and how we might make it better." Mr. Bowdler, an Amazon customer: "... Sure, the church can do a number of things to make Christianity more palatable, but when the dust settles, a crucified Messiah will always be a stumbling block or foolishness to the world, and many people will be drawn away by their own lust. Jesus must have failed many people in Israel since the Jews accused Him of being a blasphemer; Paul must have failed since most in Israel and the surrounding Greek areas hated him. When we stand before God, we cannot blame imperfect Christians and outdated churches as an excuse for not following Christ: 'God I did not become a follower of Christ because some Christian offended me when he told me that homosexuality is a sin; it hurt my feelings.' However, in our efforts to change this falling away, every church should be designed to give Christians the tools to be self-feeders so that they can have a personal relationship with Christ and the skills to reach the unsaved." "The nation's population is increasingly resistant to Christianity...the aversion and hostility are, for the first time, crystallizing in the attitudes of millions of young Americans. A huge chunk of a new generation has concluded they want nothing to do with us. As Christians, we are widely distrusted by a skeptical generation. We are at a turning point for Christianity in America. If we do not wake up to these realities and respond in appropriate, godly ways, we risk being increasingly marginalized and losing further credibility with millions of people." "...how firmly people reject-- and feel rejected by-- Christians. ... When you introduce yourself as a Christian to a friend, neighbor, or business associate who is an outsider, you might as well have it tattooed on your arm: antihomosexual, gay-hater, homophobic. I doubt you think of yourself in these terms, but that's what outsiders think of you." "I'll never forget sitting in Starbucks, poring through the research results on my laptop. As I soaked it in, I glanced at the people around me and was overwhelmed with the thought that this is what they think of me. It was a sobering thought to know that if I had stood up and announced myself as a 'Christian' to the customers assembled in Starbucks that day, they would have associated me with every one of the negative perceptions described in this book." Clearly, as Chapter 1 begins, "Christianity has an image problem." Kinnaman has worked with George Barna since 1995 and is currently president of the Barna Group -- the main specialist conservative Christian polling group in the U.S. He has designed and analyzed over 500 studies. Gabe Lyons from the Fermi Group, a collective of cultural innovators. Fermi commissioned the study that provided data for this book. Title: "unChristian, What a New Generation Really Thinks about Christianity... and Why It Matters"
Format: Hardcover. Also available in Audio CD. 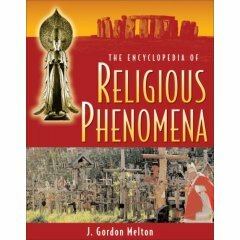 "The encyclopedia of religious phenomena"
Review and/or order this book safely at 27% off the list price from the Amazon.com online book store. "From sacred mountains and places of pilgrimage to visions and out-of-body travel, this reference explores unusual and unexplained physical events, apparitions, and other phenomena rooted in religious beliefs. Each entry features a balanced presentation and includes a description of the phenomenon, the religious claims surrounding the occurrence, and a scientific response. Touring the world and history, this comprehensive reference includes entries on angels, comets, Marian apparitions, and religious figures such as Jesus, Mohammad, and Lao Tzu." Reference & Research Book News: "The [book's] result cannot help but be inspiring or alarming, depending on your understanding of true faith." The Modesto Bee: "If you can't learn an interesting bunch of facts from this book, you must already have a doctorate on the topic." The Dallas Morning News: "[T]his is an entertaining and fascinating look at an astonishing variety of ways that people experience belief." J. Gordon Melton is the director of the Institute for the Study of American Religion in Santa Barbara, CA. Founded in 1969, ISAR specializes in the study of America's churches and religious organizations. Dr. Melton is the author of more than thirty books on American religious life and history, including the Encyclopedia of American Religions (Gale Group, 7th edition, 2002), American Religion: An Illustrated History (ABC-Clio, 2000), Protestant Faith in America (Facts on File, 2003), and the Encyclopedia of Protestantism (Facts on File, 2005). Title: "The Encyclopedia of Religious Phenomena"
"In God we doubt: Confessions of a failed Atheist"
Review and/or order this book safely at 20% off the list price from the Amazon.com online book store. "He went looking for God and ended up an angry agnostic © unable to believe but enraged by the arrogance of militant atheists. It©s hard to see the purpose of the world, he says, but don©t blame its evils on religion"
"Radio presenter and national treasure John Humphrys tackles the big question through his own personal journey and argues that doubt is the only credible belief to have and takes us along the spiritual road he himself has traveled." "Throughout the ages believers have been persecuted -- usually for believing in the "wrong" God. So have non-believers who have denied the existence of God as superstitious rubbish. Today it is the agnostics who are given a hard time. They are scorned by believers for their failure to find faith and by atheists for being hopelessly wishy-washy and weak-minded. But John Humphrys is proud to count himself among their ranks. In this book he takes us along the spiritual road he himself has traveled. He was brought up a Christian and prayed every day of his life until his growing doubts finally began to overwhelm his faith. As one of the nation's most popular and respected broadcasters, he had the rare opportunity in 2006 of challenging leaders of our three main religions to prove to him that God does exist. The Radio Four interviews -- Humphrys In Search of God" -- provoked the biggest response to anything he has done in half a century of journalism. The interviews and the massive reaction from listeners had a profound effect on him -- but not in the way he expected. Doubt is not the easy option. But for the millions who can find no easy answers to the most profound questions it is the only possible one." My years as a reporter and foreign correspondent took their toll. I was not much more than a boy when I watched the miners of Aberfan digging for the bodies of their children after the coal tip crushed their school. A few years later I was watching weeping mothers trying to free the bodies of their children from the ruins of houses wrecked by an earthquake in Nicaragua. In various African countries I have seen children, all hope gone from their blank and staring eyes, slowly starving to death. In divided countries all over the world I have seen the bodies of young men horribly mutilated by other young men for no other reason than that they belonged to the wrong tribe or religion. In war zones I have listened to soldiers © ordinary people like you and me, with their own children to love and care for © justify the slaughter of other entirely innocent human beings, other children. And over and over again I was asking myself the other Big Question, ... where was God? My spiritual journey © if that©s not too high-falutin© a notion © took me from my childish Big Questions to my ultimate failure to find any corresponding Big Answers. I have ended up © so far, at any rate © as a doubter. It©s clear that I©m far from alone. In almost half a century of journalism I have never had such a response to anything I have written or broadcast as I did to last year©s Radio 4 series Humphrys in Search of God. The letters arrived by the sackful. It felt a bit like putting my fingers on the religious pulse of the nation; and the pulse is still strong. However empty the pews may be there are plenty of people with a sincere and passionate belief. There are also plenty of people who think it©s all a load of nonsense. What surprised me is how many think of themselves as neither believers nor atheists but doubters. They, too, are sincere. Devout skeptics, if you like. And many of them feel beleaguered. I©m with them. SINCE starting to write my book, I have fallen into the habit of asking almost everyone I meet if they believe in God. And here©s the interesting thing: it was only the atheists who seemed absolutely certain. John Humphrys (1943-) is a highly respected British broadcaster. He was the first journalists at the British Broadcasting Corporation's to present news programs on both television and radio. John became a controversial figure in 1995-MAR, when he was attacked for his aggressive style of interviewing politicians. In his spare time he plays the cello and promotes the purity of the English language. He has written books on food, language, and social change. Title: "In God we doubt: Confessions of a failed Atheist"